I’m hearing a lot about testosterone replacement therapy (TRT) these days—mainly among men. But testosterone isn’t something only men should be concerned about, it’s very important for the health of women, too. The question is, whether you’re a man or a woman, do you really need pricey therapy prescribed by your doctor or some phony supplements sold online that say they will boost testosterone? Or do you have other options? Read on for secrets on possible natural low testosterone treatment. When it comes to fitness, wellness, strength, mobility and healthy body composition, there might not be anything more important than testosterone. This hormone plays a significant role in how much fat or muscle you put on, your energy levels, and basic functionality. Unfortunately, testosterone levels begin to drop steadily in men and women after age 30 (particularly in men). 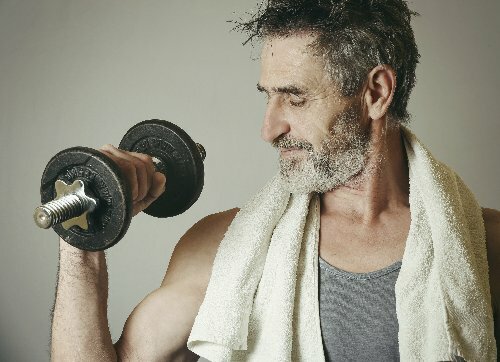 Thankfully, you don’t necessarily have to spend a ton of money on TRT; there are natural ways to maintain and boost the amount of testosterone in your body. Exercise is probably the best way to increase baseline testosterone levels, especially if you are deficient. Weight training (and sprinting) leads to post-workout spikes in testosterone and other hormones that work to repair and build tissue. This increases as you build more muscle and make more progress in your lifts. The best movements to stimulate testosterone are multi-joint compound movements like squats, bench presses, chin-ups, and deadlifts. You can work out at home using a chair for squats and push-ups in place of a bench press. If you’re inexperienced, you can hire a trainer to at least teach you the basics and proper way to lift. Eating enough fat—and the right kinds of fat—is essential to optimizing testosterone levels. By healthy fats I mean unsaturated fats: polyunsaturated, including omega-3 fatty acids, and monounsaturated fats. Healthy fats help you to produce enough hormones, so getting about 30% of your daily calories from these healthy fats—or more—should put you in the optimal range. A low-fat diet can actually reduce testosterone, so avoid one of those! In addition to healthy fats, eating a wide variety of fruits and vegetables every day helps keep your immune system strong, which in turn reduces inflammation and creates an ideal environment for testosterone synthesis. Eating a wide variety of animal protein is also ideal, as it helps to promote tissue growth and maintenance and utilizes the testosterone you’re producing. Avoid sugars, refined carbs, and alcohol; these actually work toward turning testosterone into estrogen, encouraging muscle weakness, atrophy, and low energy. Eating the following foods in particular—a combination of all the tips I just mentioned—can be very helpful in promoting adequate testosterone levels, while providing nutrients like zinc and magnesium, which are both very important for testosterone levels. Don’t focus on just one or two foods in particular; it’s important to get a wide range of these foods for optimal testosterone health (and good health in general). Stress causes cortisol levels to rise, which is an enemy of testosterone, so you want to find a way to reduce the stress in your life. Exercise is great for this, as are practicing mindfulness, yoga, tai-chi, socializing, and quiet time. Keeping a regular sleep schedule also helps reduce cortisol and encourages testosterone production. If you’re worried about your testosterone levels, go get a test with your doctor. In some cases, TRT may be recommended, but now you know there are also some things you can do on your own to boost levels naturally. Poliquin Group Editorial Staff, “Ten rules for raising testosterone for a stronger, leaner body,” Poliquin Group web site, February 28, 2014; http://main.poliquingroup.com/ArticlesMultimedia/Articles/Article/1129/Ten_Rules_For_Raising_Testosterone_for_a_Stronger,_Leaner_Body.aspx, last accessed September 7, 2016.